For many colleges and universities, event planning is an important aspect of fundraising, recruitment, and student engagement. And for higher education institutions relying on Salesforce to track data, it only makes sense to use your CRM for event management as well. While it’s possible to use a third-party platform to manage attendees and logistics, you’ll likely find that working within two separate systems (i.e., your event management platform and your CRM) will only leave you with incomplete data, unaccounted-for tasks, and a lot of other headaches. Before we dive in, you should make sure your organization is equipped with Salesforce as well as a powerful Salesforce event management app. Need help finding the right one? Check out Double the Donation’s list of top Salesforce partners for profitable events. When planning alumni events, your primary focus will be bringing in funds for your school. You might achieve that objective through a variety of fundraising events, from alumni dinners to silent auctions to major donor galas. However, in order to maximize your alumni fundraising, you’ll need to do more than just plan an event—you’ll need to lay out a strategy for effectively keeping up with and engaging alumni over time. To do that, you’ll need the help of your Salesforce CRM to store relevant data that you can then use to inform your event planning strategy. Alumni social media profile information. With all of that data on your side, you can not only plan an event that speaks to alumni interests and lifestyles, but you can engage them in the most effective way before and after your event, as well. When you have a more in-depth understanding of your audience, you’ll be able to plan more intentional fundraising events that are the most effective in raising money your school. No matter what type of event your team is hosting, make the most of it by utilizing your Salesforce CRM and an intuitive event management app stocked with all the right features. Because your event management tools are integrated with your CRM, all the data you need will be available within one system. You won’t have to transfer data back and forth, nor will you have to work with two platforms—everything you need to plan your event will be housed centrally within Salesforce. Create a strategic guest list. Target prospective major donors within the area that your event is taking place; then, send out personalized invitations to those alumni who are most likely to give big. Set personalized ticket prices. While older alumni might be excited to pay a steep ticket price that benefits their alma mater, recent alumni might be deterred by a high price. Segment data based on graduation year, giving history, or income and set ticket prices that correspond to each group’s ability. Design intuitive registration forms. Use your event management app to create responsive, well-branded registration forms that help you collect the data you need for your event. That data will automatically flow into your CRM so you can access it later on, too. 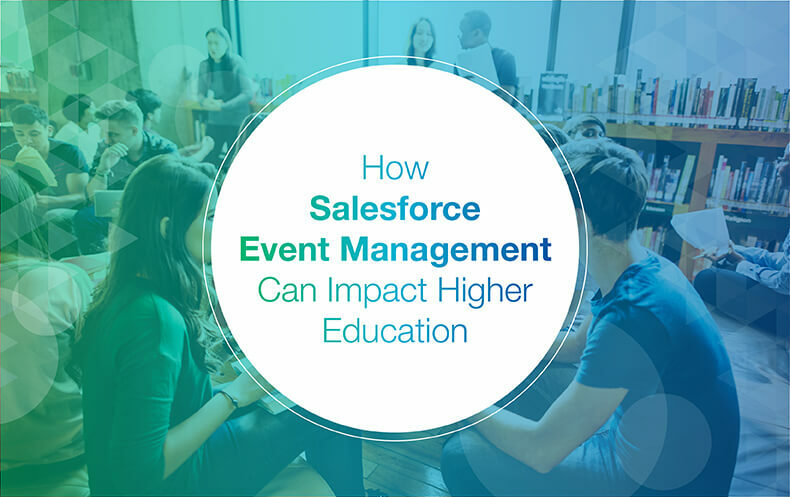 Your Salesforce event management app can help you tailor your strategy to fit your event and your alumni to help you bring in more money and maintain engagement with every alum in your database. Takeaway: The information you track and record from your Salesforce CRM can help you plan better alumni events and engagement. That way, you can develop long-lasing relationships with your alumni. Bonus! For more features that you can expect from a great Salesforce app, check out this comprehensive list from Fonteva. Current students won’t necessarily be donating funds to your university or college (they’re already paying tuition, after all! ), but that doesn’t mean you won’t be working to engage them through events. That’s where your Salesforce event management app comes into play. Events help schools build relationships with current students, which could lead to donations after graduation. Plus, your school can start collecting valuable information on current students through event registrations. Academic fairs per department or major. To accommodate events that are so unique (and students with ever-changing needs), you need an event management tool that can support anything and everything. Search for an event management app that allows you to customize your event planning experience per event. You should be able to set up custom event types within your event management app to use as templates for future events. That way, once you’ve created one standard academic class as an event, for example, you can quickly apply the same fields to the next classes you build. Recurring event registration will allow students to sign up for the entire series at once. That way, you can track individual class sessions or manage an entire course series at once. Multi-track event registration will allow students to choose which track they’ll be attending and instantly sign up for all events grouped within that track. This is a great option for department- or school-wide events with specific sessions laid out by major or department. Group event registration enables students to register more than one individual at once for an event. Student organizations, department faculty, or classes can use this tool to sign up and select a block of seating together, if applicable. Your Salesforce event management app can also allow you to customize your registration form fields so that you can collect all the relevant data you need. If you’re working with a native app, then the information will automatically flow to your CRM without any manual data migration or entry on your end. If you’re not familiar with the term, a native app is a tool that was created in Salesforce specifically for Salesforce users. Essentially, the two programs work side-by-side so that your school has a seamless experience. That way, your students’ information is always linked to your event management tools and vise versa. In contrast, working with a non-native event management tool requires more work from your nonprofit. For example, many schools may consider using Eventbrite as their event promotion tool. While the two programs integrate with each other, you’ll still have to manually transfer information to get a full picture of your data. Your school shouldn’t settle for a tool that requires manual migration of information. That’s why we recommend reading Fonteva’s list of Eventbrite alternatives to find a better solution. Takeaway: While students aren’t likely to donate, it’s still important to start developing relationships as it could lead to donations in the future. Using event management software can make event and course registration easy for your team to handle. Bonus! From mobile engagement to donation kiosks, there are so many different ways you can keep in touch with current students. Learn more about 5 fundraising tools for higher education. Last but certainly not least, your university will inevitably be focusing on how to effectively recruit prospective students and engage them before and after they’re accepted (or committed) to your school. A major way to court prospective students is to plan events to show off your campus, academic programs, and student life in person. Much like with alumni, to fully engage your prospective or incoming students, you’ll need to plan events that are strategic and seamless. Using a Salesforce event management app allows you to sort through all data in one place. That means being able to access the full realm of prospective student information without even navigating to a new screen. Having a complete view of data is especially important for prospective students, as they’ll be working with multiple departments within your school at any given time (think: financial aid, student housing, their academic department, just to name a few). Salesforce can centralize that data and help you engage with students at your events in a more deliberate way. Send pre- and post-event surveys. Gauge interest before and after a campus visit or prospect day by asking students and parents to share their feedback. Then, store that data and use it to better your future events. Create custom event reports. No matter what you want to know about your event, you can find out in Salesforce. Not only will you be able to run reports on event data; you can analyze all of your Salesforce data at once for a truly holistic take. View and manage student profiles. In addition to measuring success on the whole, you can zero in on your interactions with individual prospects to see what’s working and what isn’t. Track all interactions, engagements, and payments so that your event-planning team is always up to date on a large and small scale. Recruitment is arguably one of the most important responsibilities of your organization, so work with a powerful event management tool to ensure your recruitment events are fully optimized for success. Takeaway: Universities will also need to connect with prospective students to encourage them to commit to your school as well as generate excitement. Using event management software, you can ask incoming students to take surveys to gain a better sense for how you can improve your events. Event management might seem like a burden on your university, but if you know how to get the most from your Salesforce CRM, planning impeccable events can be a breeze. Once you find the right event management app and devise a sound strategy, you’ll be well on your way to events that are beyond compare. And trust us: your alumni, students, and prospects will all take notice! 4 Ways Universities and Colleges Use Prospect Research – Bring in more funds for your school by identifying key donors and developing strategic engagement plans. Guide to Salesforce Event Management – For absolutely everything you need to know about planning events in Salesforce, read Fonteva’s essential guide! Top Fundraising Consulting Firms – In need of some extra help bringing in funds for your school? Read our breakdown of the top fundraising consulting firms to help you take your fundraising to the next level.